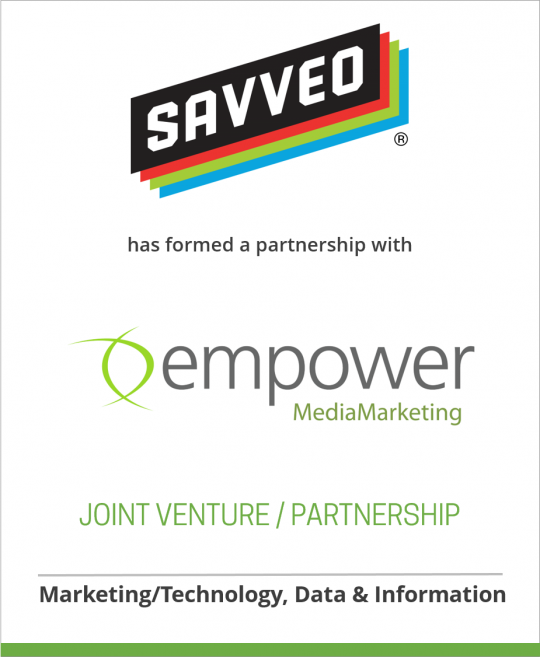 D+P client Savveo, an adtech startup at the forefront of programmatic buying for offline media, announced a strategic partnership with Empower MediaMarketing that includes a substantial investment from the leading independent media agency. Cincinnati-based Empower is the nation’s fifth largest independent media buying agency with a roster of powerful relationships that it brings to the partnership. “As programmatic buying is widely adopted across channels, the entire industry must collaborate and that is what we have done with Savveo and Scripps,” said Empower CEO Jim Price. “With our 30 years of experience in local broadcast television, we saw the opportunity and have spent considerable time building a transparent programmatic solution for local broadcast TV.” The initial focus of the partnership is developing world-class programmatic solutions for television and to that end, the firms have begun engaging major broadcast and cable companies. In the second quarter of 2015, Savveo and Empower will execute local broadcast programmatic media with Scripps-owned TV stations. For more information, visit http://www.savveo.com. Savveo Inc. is an adtech startup at the forefront of programmatic buying for offline media. Savveo offers cloud-based, enterprise technology solutions that delivers rich audience intelligence and facilitate the automated buying of local offline advertising, including broadcast. Founded in 2010, Savveo is based out of Charlotte, N.C. and Silicon Valley. For additional information please visit http://www.savveo.com.